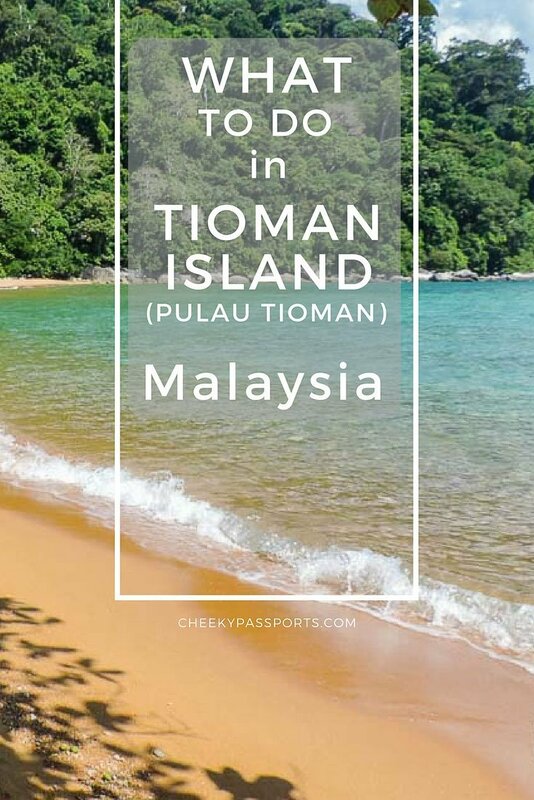 Lying on the south-eastern part of Malaysia’s peninsula, tropical Tioman Island (Pulau Tioman) is a long-time backpacker favourite. 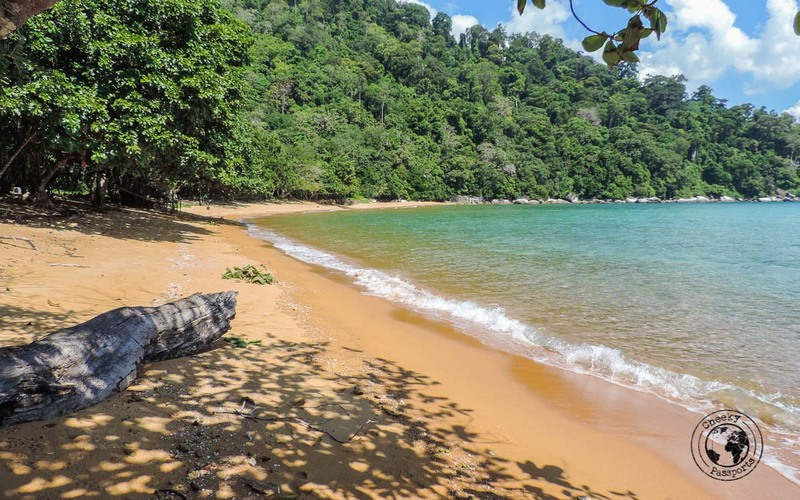 If you’re looking at what to do in Tioman, we can assure you that with stretches of sandy beaches, a pristine sea bed and dense foliage, the island is an ideal destination for those looking to take a break from mainland city life. 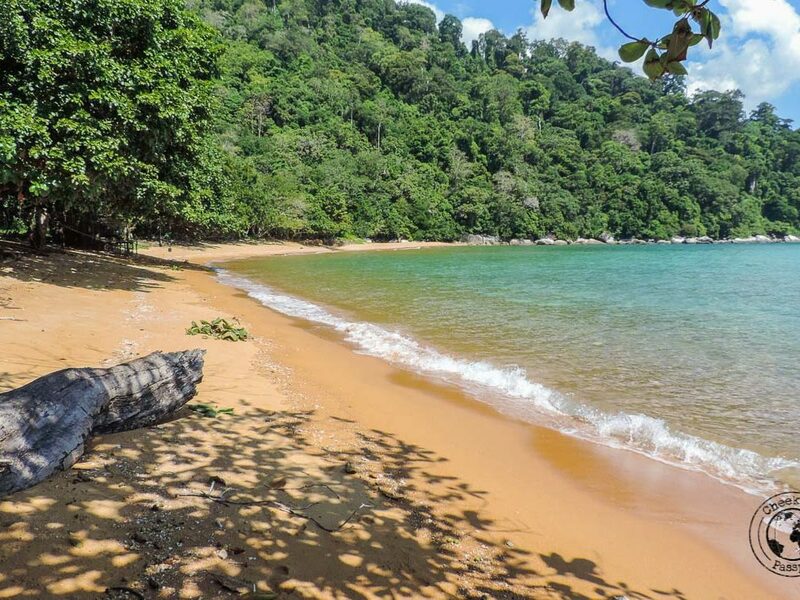 Back in the the 70’s, Tioman Island was chosen as one of the world’s most beautiful islands in the world by TIME Magazine, which contributed to its popularity, giving rise to the area’s development and rather good improvements in its tourism infrastructure. 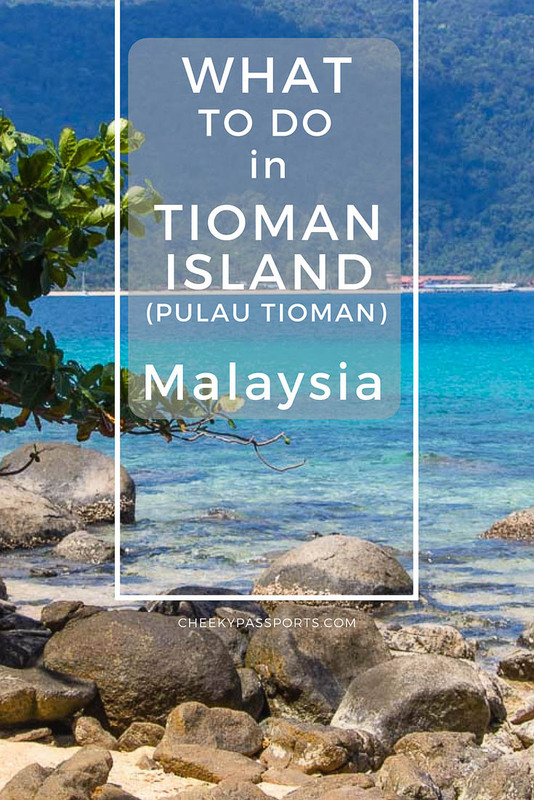 In spite of this, the island still feels very laid back and welcoming, although at the same time, there are many things to do in Tioman, which ensured that we immediately felt very comfortable exploring it. 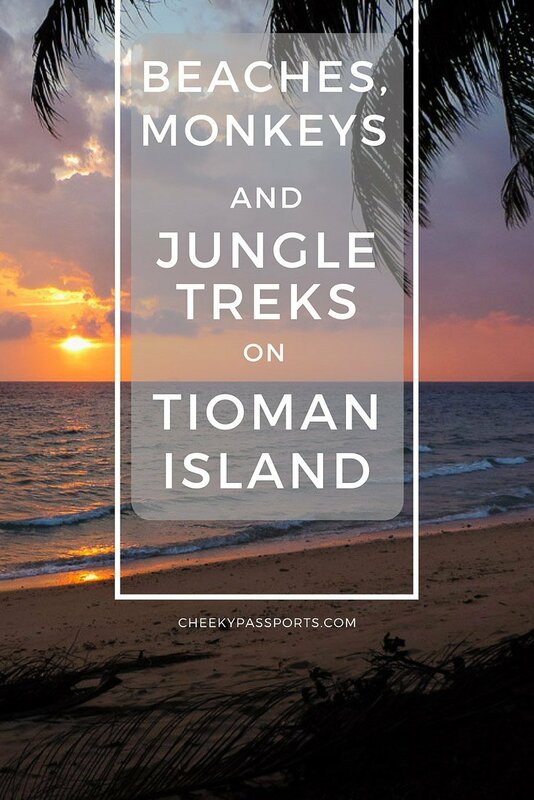 If spending time lounging on your hammock whilst forgetting about the rest of the world is on your list of things to do in Tioman, you will be glad to know that crystal-clear blue waters and golden beaches with a lush jungle backdrop make the west side of Tioman island a paradise for chilling out. 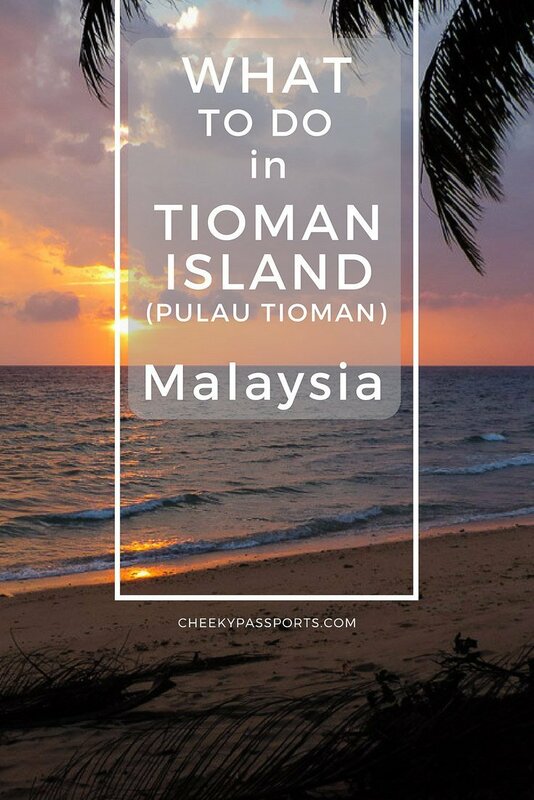 These activities are the main reason why most travelers spend time on Tioman Island, and are probably already on your list of things to do in Tioman. 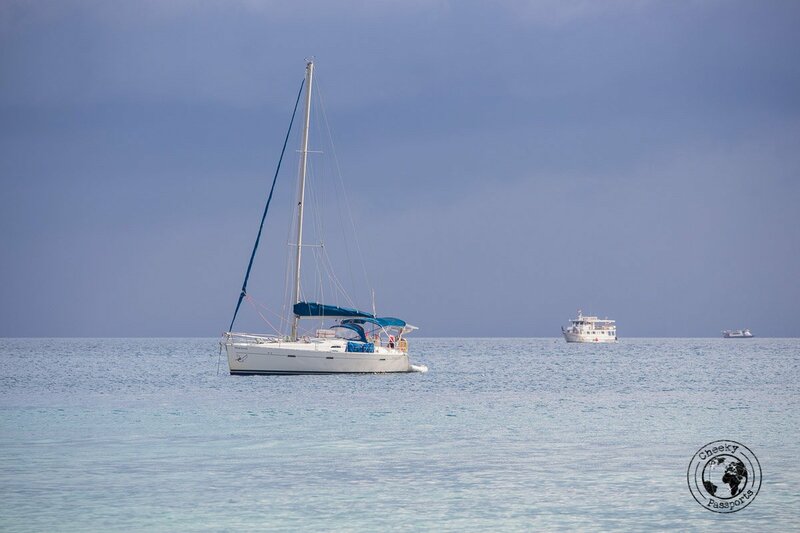 The island is very rich in coral and marine life and there are quite a number of really good snorkeling spots just off the beaches, where an abundance of colourful fish and coral gardens quickly ensure that you lose track of time. 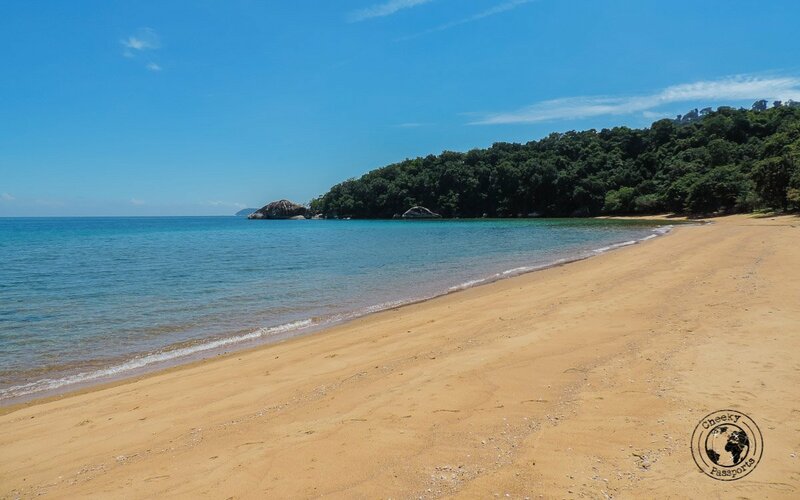 Among various things to do in Tioman, boat rides and tours to snorkeling spots further afield are available, but we were happy to spend our time around the beaches on the island itself. Penuba Beach is a short uphill 15-minute trek from the left side of Air Batang (also known as ABC). The narrow track can be found just before the luxurious ABC Chalets. 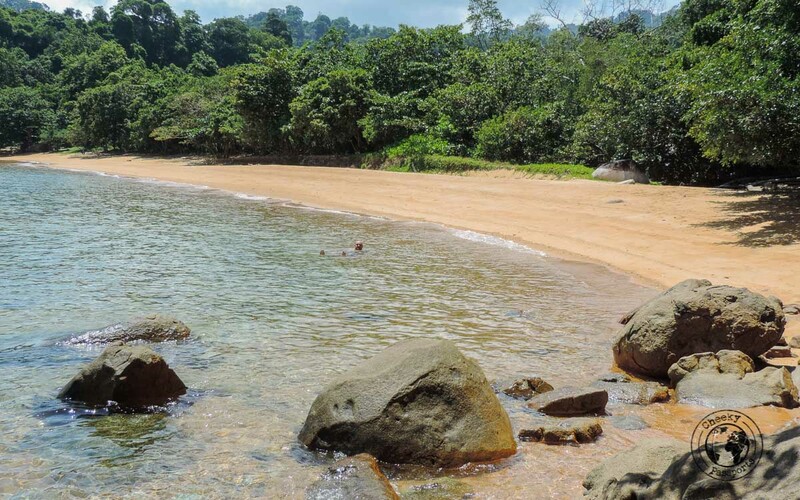 We decided to skip this beach and trek further to the adjacent Monkey Bay and Monkey Beach in Tioman, about 1.5 hours away. 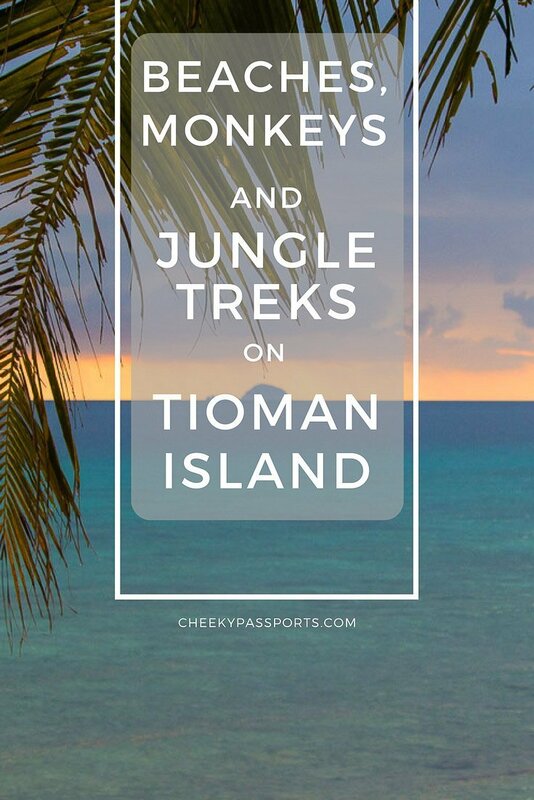 Stupidly enough, we wore flipflops thinking that it might be a short easy stroll, but as we made our way through the thick jungle foliage, often tripping on the massive roots, we realised that Tioman trekking is more than just a walk in the park! Wear good hiking shoes and take plenty of water! The leaves are wet and slippery and we tripped over and slipped several times! It is easy to stay on the correct trail if you always follow the black electricity cables running along its length. The sight of the fabulous Monkey Beach in Tioman made up for our trekking misgivings. The golden stretch of sand was completely deserted and as Nikki jumped into the water and went off snorkeling, I happily laid my towel in preparation for an afternoon of sun-worshipping. After a while, we exchanged activities and I went in search of the coral garden on the left side of the beach which was truly beautiful. Unfortunately, our underwater photos were lost when our SD card become corrupted! Nikki went to explore the left side of the beach and as I laid down my towel to start a second sunbathing session, a tidal wave completely soaked the towel and many of our belongings (yay for dry bags!) making me realise that the tide was coming in rapidly. To save the day, I decided to move further inland, where the stretch of sand was wider and laid our soaking clothes to dry on a large tree branch. As I walked to the water’s edge, I started to hear the very obvious rustling sound of our plastic bags and quickly realised that our stuff was being raided by a group of monkeys! I ran towards them and tried shooing them away, thinking that I could scare them off, but they hissed and on the contrary started advancing towards me with such confidence that I had to defend myself by swinging one of our heavy bags. Nikki who was snorkeling about 100 meters from shore, was completely oblivious to my predicament, and as I called him for support, he happily waved back and went back to snorkeling. I was almost in the water with two of the monkeys still advancing (the other went back to rummage through more things) when Nikki finally realised that I was in trouble and swam up to shore in a Phelps flash. He grabbed a stick which was floating around, and pointing it at the invaders, howled at them like a gorilla. It worked as they seemed to be scared of his large frame and menacing look. After a while they left our spot but stayed back around 10 metres observing us while we packed up our stuff and prepared to leave. No valuable items had been stolen, only our antibiotic cream and a packet of wet wipes were missing. One of the monkeys had decided to bite the cream’s metal tube and help himself to a mouthful and we can now fully confirm that Fusidic Acid cream is far from being tasty to the monkey palate. He spat it all out and grimaced in disgust as he threw the bitten tube back at us! 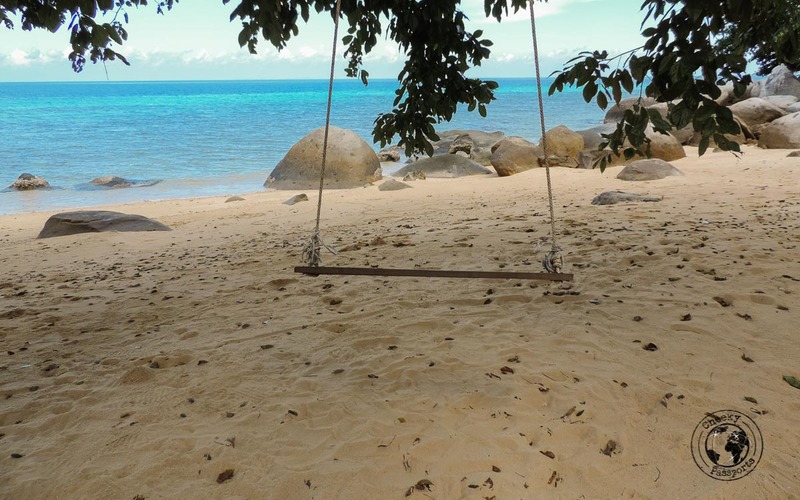 (Cheeky) Monkey Beach in Tioman fully deserves its name! The way back was uneventful as it was uncomfortable, seeing that most of what we were carrying was soaked. Towards the end of the trek, we stopped for some very expensive but extremely welcome juices at Penuba, a welcome conclusion to our Tioman trekking experience. 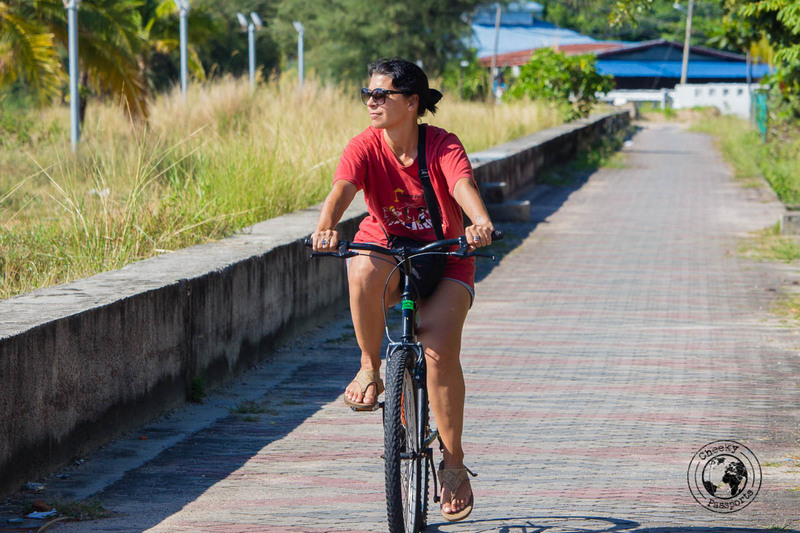 The best way to get to Tekek from Air Batang is to rent a bicycle for a 30- or so minute ride to the main town on the western part of the island. Tekek is a lot more developed than Air Batang being home to a large jetty and an airport. Duty-free shops can also be found here where it is possible to buy cheap beer, wine and spirits. Considering the scarcity of alcohol in Malaysia, and how expensive it is, the shops were a very welcome discovery! 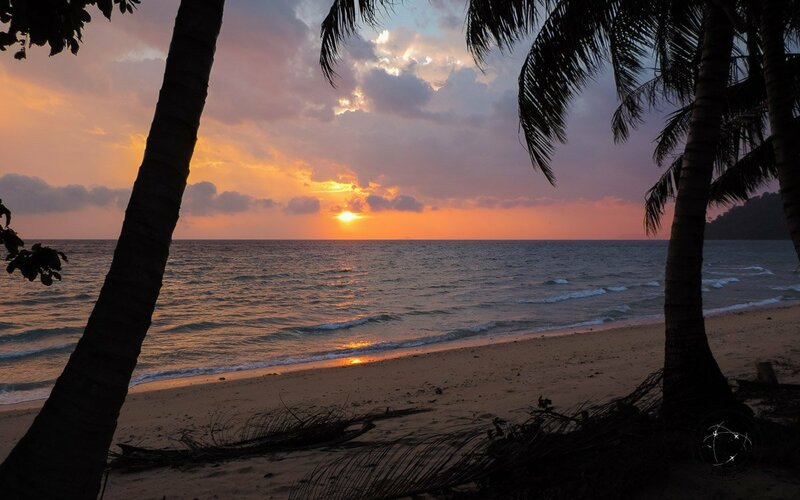 This might be an obvious inclusion on your list of what to do in Tioman, but we believe that sunsets here are some of the best in Malaysia and we considered ourselves lucky to witness a gorgeous spectacle every evening! Be sure to find a good sunset spot! Diving around the island one of the most popular things to do in Tioman, with dive sites which include boulders, coral reefscapes and many wrecks. 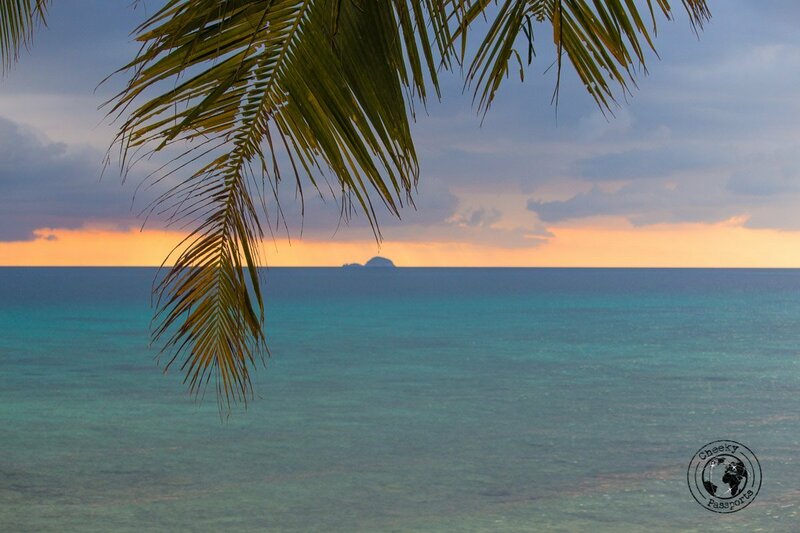 In fact Tioman island is one of the most famous dive destinations in all of Malaysia. Several diving centres are found all around the island, many even offering a wide range of services including courses for beginners. Related – looking for other dive spots in Southeast Asia? Check out Raja Ampat in Indonesia! 6. 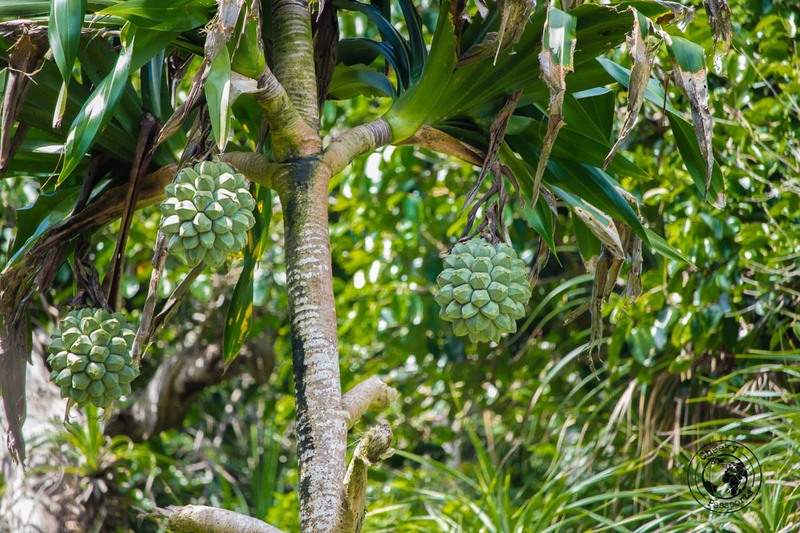 Spot the wildlife on Tioman Island! 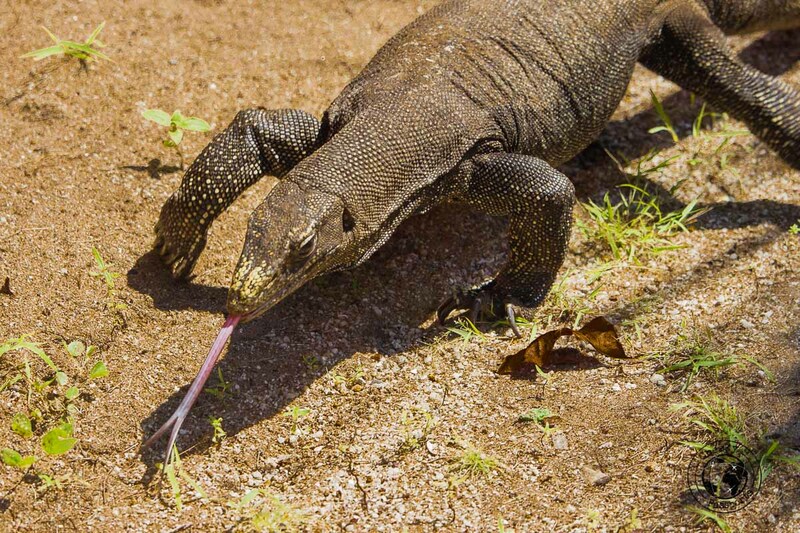 Monitor lizards and cats are prevalent on the island. The former are very shy and run away into the bushes as soon as they feel observed, but the latter are really friendly and seem to enjoy cuddling up to visitors! 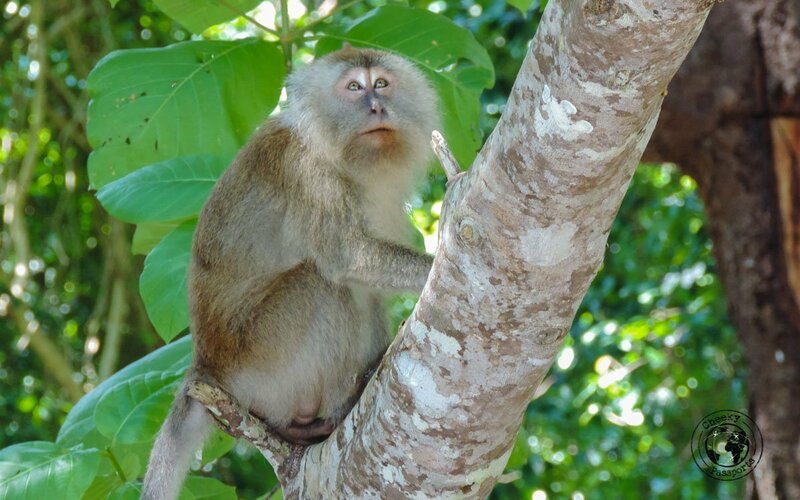 It is actually very common to see monkeys and monitor lizards around your cabin, just make sure that they don’t actually manage to get in or grab any of your valuables! On the East coast of Tioman island lies Juara village. This side of the island is more secluded and less busy than the western side, but it has less facilities too. 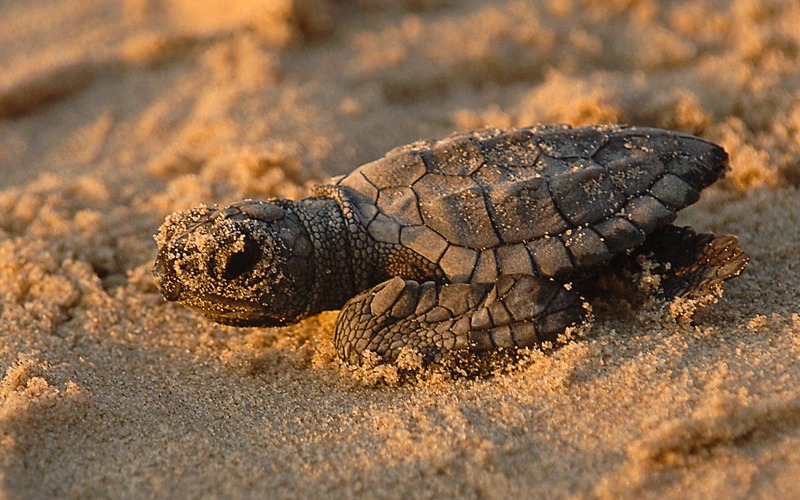 Accommodation in the form of beach huts and resorts can be found here as well, but what makes the area unique is the Juara Turtle Project, a research and conservation project aimed at protecting marine turtles. 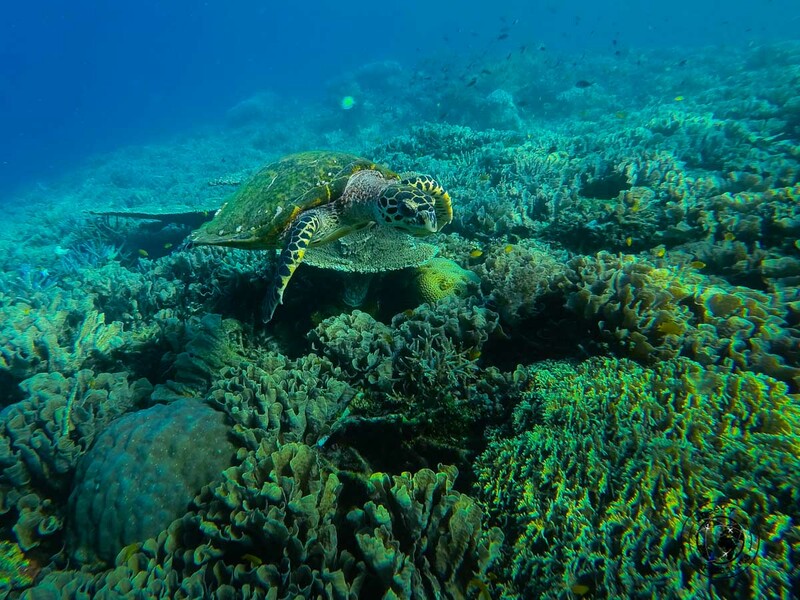 Do put this on your list of things to do in Tioman if you would like to learn more about turtle conservation! Juara Village on the East side of the island, can be reached from Tekek on the West side of the island via 4WD. The road cuts straight through the jungle, connecting the two sides of the island. Ask your accommodation host to arrange transportation for you, or hail a 4WD taxi – you will find lots of those in Tekek! Check for the latest accommodation deals in Juara Village, on Booking.com, or Agoda. Asah Waterfall on Tioman island, is located close to the village of Mukut and is accessible via a sweaty trek. Once again, we should stress that solid shoes are essential for Tioman trekking, so do not try this is fliflops! The walk up to the waterfall is not very long but the heat and humidity will make it feel so much harder! The water is cool and refreshing, and you’re going to want to cool down in the cold-water pools for a long time after your trek! Juara Waterfall is accessible from Juara Village and is not as impressive as Asah, but well worth your while, especially if you’re staying in Juara village! Paya Waterfall is the third waterfall in Tioman, and probably the least impressive of the three. It is located close to Paya village. 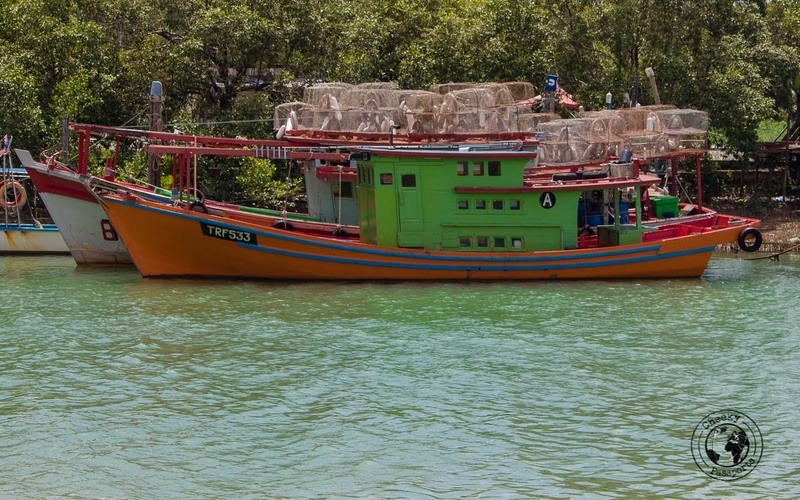 Several private charters offer fishing trips around Tioman Island, making this a great destination if you’re looking at what to do in Tioman, especially if you’re a fishing enthusiast! Many of the charters arrange your freshly-caught fish to be barbequed on a beach at sunset, making this one of the best things to do in Tioman! Traveling during the Hari Raya period, just after Ramadan, when many Malaysians were on holiday, meant that a lot of transport options were full when we tried booking them, which was rather frustrating. We therefore had to travel from Kapas island via a more complicated route. Following our stay in Kapas Island, we got a Grab car (taxi) from Marang jetty to the bus station and stayed in the food court there until it was time for the bus to depart to Kuantan Sentral bus station. The journey to Kuantan took 4.5 hours and cost RM 20 (about €4) each. There are cheaper bus options but they were either fully booked or departed at inconvenient hours. Bus tickets can either be bought directly at the bus station, or online here. The bus trip from Kuantan Sentral to Mersing bus terminal took about 3 hours and also cost about RM 20 (about €4) which meant that we arrived in Mersing at around 1.30am! The original plan was just lay at the jetty until early morning to wait for the ferry to Tioman, but it turned out that the only departure was scheduled for the afternoon. Ferry departure varies depending on the tide. Once we got there, we realised that we were far too tired, and decided to get a room at the nearby Embassy Hotel, just across the bridge from the bus terminal for 60 RM (about €12). This turned out to be a good idea as we slept comfortably until late morning. Honestly the best RM 60 spent in Malaysia! Check out the latest accommodation deals in Mersing on Booking.com or Agoda or Hostelworld. The walk from the hotel to Mersing Jetty took about 15 minutes. 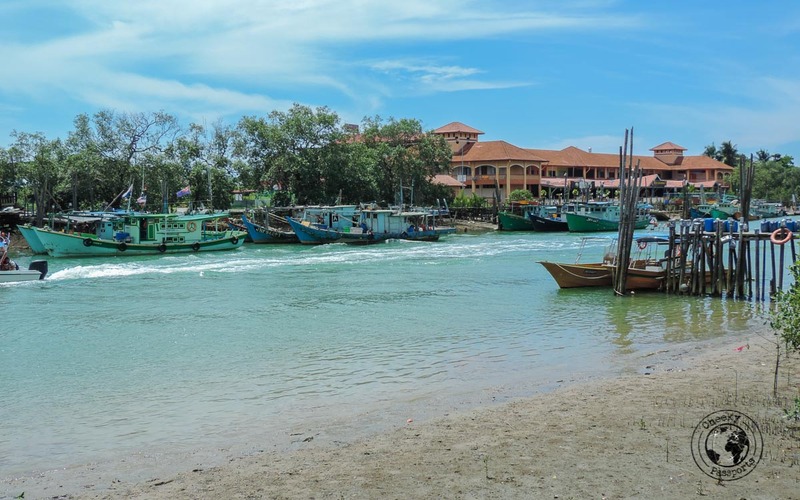 Mersing is a very small town with a few shops selling a little bit of everything. Once we were at the Jetty, things became less clear. Our pre-purchased tickets (we paid RM 80, that’s about €15.60 each, return) for the ferry to Tioman were checked and we were then directed to another stall where we were asked to pay the Tioman Island fee. Later we were further directed to yet another kiosk to settle our Marine Park fee (combined cost of both fees is RM 50, that’s about €10, each). We were then asked to go to another stall to show our passports and proof of purchase of the above fees, and asked to sit in the waiting area for our ferry. Once the ferry to Tioman arrived, there was a mad rush to it, but when we got to the checkpoint, were told that we needed to ‘check in’ at yet another stall before we could board. Quite frankly, the whole process seemed unnecessarily complicated! Accommodation on the island is as plentiful as it is diverse ensuring that both budget and/or luxury travelers are catered for. We chose to stay in Air Batang area (also known as ABC), which is home to as wide range of very affordable beachside chalets. Our fan-cooled chalet at Mokhtar’s Place, for which we paid RM 50 (€ 9.90) per night (with attached private bathroom), was perfect for viewing sunset in the evenings, and a great base for planning out what to do in Tioman! We discovered the restaurant at South Pacific Chalets on our first night and liked the food served there so much that it became our breakfast and dinner place of choice. 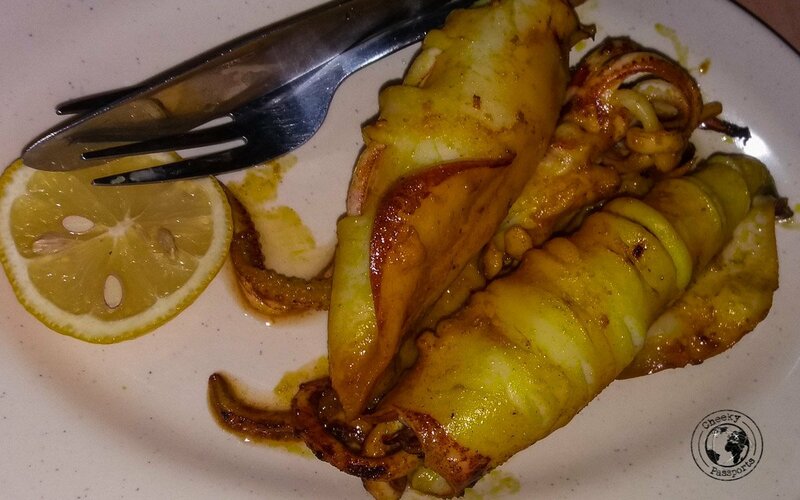 The restaurant is a pleasant 20-minute walk away from Mokhtar’s Place and serves bowls of fruit and porridge for breakfast besides the usual breakfast items, and large portions of the best grilled calamari ever for dinner. You can even get veggies, soup, chicken and fish cooked in a number of styles and sauces. We noticed that like us, many of the customers returned there each night! Do note that the food takes a little while to be served, and it is useless questioning the owner about the wait. He will happily point out to a placard stating ‘No hurry up’. Your choice! After the beauty of Kapas, we expected Tioman to be underwhelming in terms of beaches and charm, but we were happily surprised to discover that although Tioman Island is a lot more developed than Kapas, it does not lack the amazing beaches and laid-back vibes we had become accustomed to, making it my second favourite spot in Malaysia. 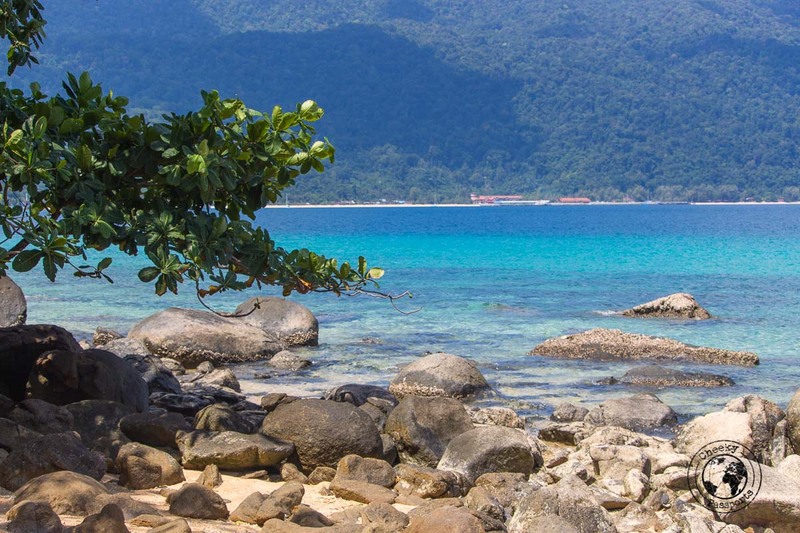 If you’re looking for the best Malaysian islands, we highly recommend Tioman Island!